Coming soon an Application from McAfee to identify pirated movies, music, programs and ebooks. McAfee the popular anti-virus maker has filed a patent for a new technology which prevents users from accessing the pirated, illegal content on the web. 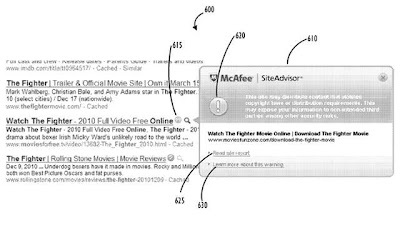 McAfee plans to integrate this technology with its widely used SiteAdvisor tool to detect and block illegal content. If you are hooked to downloading movies and torrents, this technology will not allow you to download the illegal movies and take you to the legal sites were the content is available, like the Amazon.com. 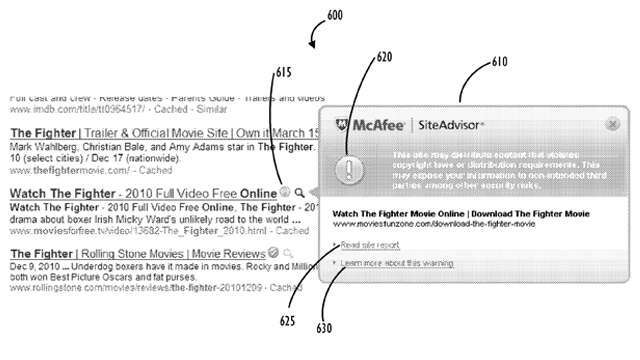 The McAfee's patent describes the technology as “preventing (or at least deterring) a user from inadvertently or directly consuming illegal content on the Internet.” MaAfee says tt employs a cloud-based blacklisting mechanism to filter content and detect if the link you just clicked is illegal or not. The system will then warn you of illegal content, block access to webpages, or offer purchasing advice. The technology filters the web search results and also the social networks. So if your friends tell you about the latest movie they enjoyed and where you can download it, the SiteAdvisor will detect it and warn you. The McAfee has added that the technology could use a cloud-based system for centralised analysis of whatever you click. The system would use data from web crawlers or other blacklists to analyse content on the web and add it to its own blacklist. In short, the system can monitor which URLs you click, send those URLs to a cloud for “analysis”, and depending on how it is set up, show you a warning message, block access, or give you legal alternatives. This kind of system already exists with the popular search engine Google giving you a warning about the malicious websites and saying the visiting that particular site will harm your computer. But as of now it has not been centralized and archived. The most potential victims of SiteAdvisor will be the torrents, uploading sites and downloaders. However for you and me, the users the technology can be a pain but it will be a very good tool for schools, colleges, offices and institutions. For other security related news visit here!